I’m always looking for new baby products to try with my 4-month-old son. He’s been having a hard time sleeping and I thought maybe it had to do with the unusually cold weather we’ve had in Seattle. 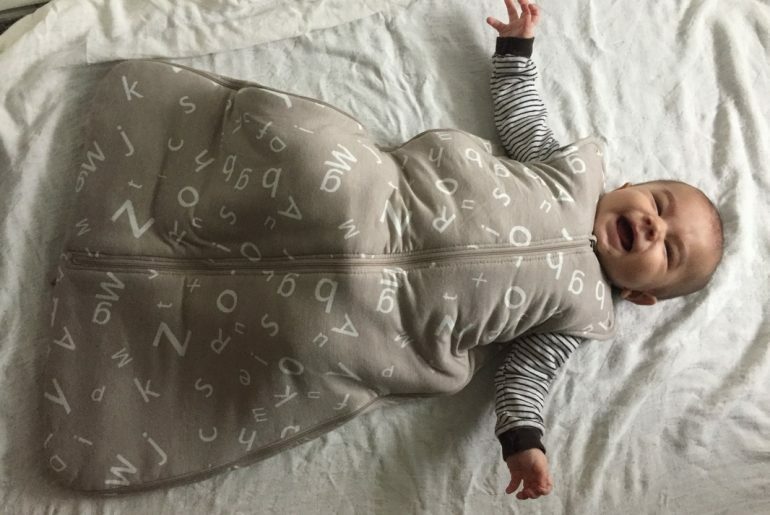 I came across Gunamuna’s Gunapod baby sleep sack and it looked like a great fit for my family. They sent me their Alphabet Luxury Bamboo Duvet for review. As soon as it arrived, I was giddy. I tore open the box, ripped off the bag and felt the fabric. It was so soft. It was softer than my baby’s skin. I found myself petting it over and over because I couldn’t get over how incredibly silky it felt. My son was starting to get sleepy, so I thought I’d try it out on him immediately. The zippers were really smooth and it was easy to get him in the Gunapod. My son loves anything soft and he seemed to enjoy rubbing his cheek on the Gunapod baby sleep sack. I put him in his swing and he fell asleep instantly and stayed asleep for longer than usual. When he woke up, I kept him in the Gunapod since the house was cool and I wanted him to stay warm. I felt some rumbles and my first thought was “Please don’t blow out my Gunapod, I mean YOUR Gunapod!” I laid him down and it was so easy to unzip the bottom of the sack, keeping my son nice and warm while I checked his diaper. Thankfully, it was a false alarm! My 3-year-old was able to easily zip up the Gunapod around my baby all by himself. We’ve been using it every night for the past 3 weeks and not only has he kept it clean (knock on wood) but he hasn’t felt cold once. We’re able to use lighter weight pajamas (instead of fleece) and he stays comfortable. He also seems to want to stay in it all morning. When we start doing formal nap times with him, we will be using this Gunapod as his signal that it’s time to sleep. My son gets giddy when we put him in the Gunapod. It’s so incredibly buttery soft! The zippers are smooth and easy to use. It’s a great weight for colder weather. The Alphabet pattern is a nice neutral. Each size lasts a long time. Size small fits babies 0-9 months and size medium fits babies 9-18 months. The hypoallergenic bamboo fibers actually breathe better than cotton. It’s breathable, moisture-wicking and antibacterial. Their WONDERZiP® 4-way, all-around zipper provides you with the easiest diaper change under any conditions. I wish they had more colors/patterns available. I wish they had one in my size. We’ve been using it non-stop every night for the past 3 weeks and my husband and I can’t get over how much we like the Gunapod baby sleep sack. I’ve been trying to think of anything I don’t like about it and it’s been a struggle. I even went on Amazon looking for negative reviews to see if I was just missing something, but I came up empty. 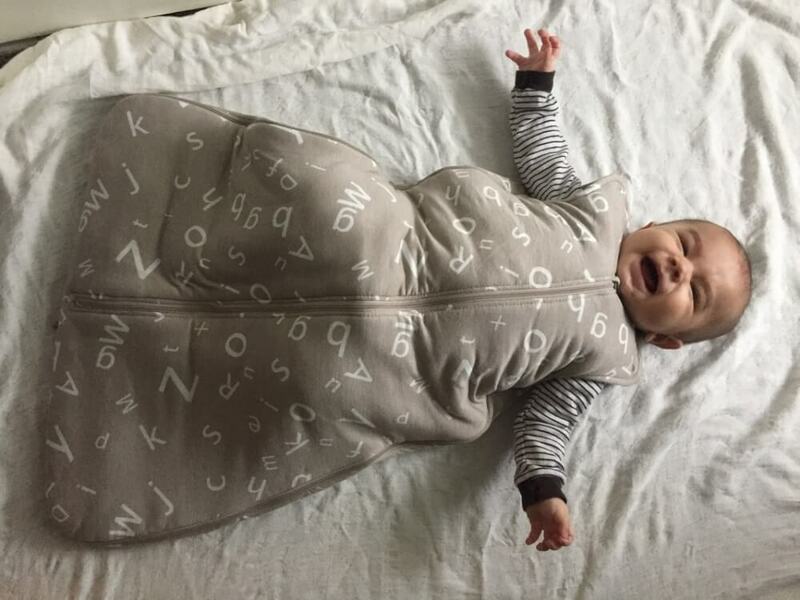 If a new Mom asked me what baby sleep sack she should buy for her baby who is no longer being swaddled, I would recommend she get this product. Thank you Marci In Mommyland for this amazing review!